With the temperatures starting to drop for the fall, plant growth is starting to slow and insects and other animal life are starting to become less active. That means that some animals will actually be on the move more since they need to search harder for food sources. Mice can be a particular nuisance during the fall. Mice are very curious, and they will explore your home for food. They can get in through pipes, openings for vents and wiring, and even small cracks in your walls or foundations. They will even hitch a ride in a box or bag that you bring inside or wait patiently for a door to open. Mice will also find crevices and openings around your home to nest. Since mice are very small and like to hide out in small openings, it may be hard to see them on the move. They are easily scared by people and pets, so they won’t wander out into the open easily if they see others. You need to be aware of the signs that you have a mouse in your house so that you can nip the problem in the bud quickly. Otherwise, one mouse can turn into two, which can turn into more, and before you know it, you have an infestation on your hands and have to call a pest exterminator in Queen Creek to take care of the problem for you. Everybody poops. Mice just don’t do it in the toilet. Instead, they do it wherever they happen to be when nature calls. Fortunately, that means that you have clues about the presence of mice in your home. The droppings are usually black and between a quarter inch and a half inch. You won’t be able to see the urine with your naked eye, but if you have a black light, it will make the urine glow like the Fourth of July. Just pass the light over an area that you suspect, and you should see the streaks or splatters light up. You can do this during the day or night. Mice will nibble on things that aren’t food in their search. They might nibble to see if the item is edible, or they might nibble to make their way through an area. One thing you might notice are chewed electric wires, such as on your electronics or appliances. Not only are these a sign of a pest problem, but they are also very dangerous for your home. The exposed wires can lead to electrical fires that put your home and family in jeopardy. Mice do not discriminate in their quest for food. They will also chew on your furniture, including wood, cloth, foam, leather, and wicker. If they can chew it, they will. Check out the legs and edges of your furniture for signs of chewing or teeth marks. Also look at your curtains, baseboards, carpet and doors. The teeth marks are tiny, but if a mouse has been at work for a while, it will be obvious. Of course, the main goal for mice is food. They will be drawn to your pantry and cabinets, and they will try to chew through packaging to get to the food inside. Look wherever you store food for signs of holds in boxes or bags or chew marks around the edges. You can also look for crumbs that may be a sign that mice have been successful in getting to the contents inside. Mice can be a real nuisance in your home. They can destroy your furniture, put your home at risk of fires, and spread bacteria that poses a threat to your family’s health. If you suspect that you have a problem, you need to call an experienced mouse exterminator right away. 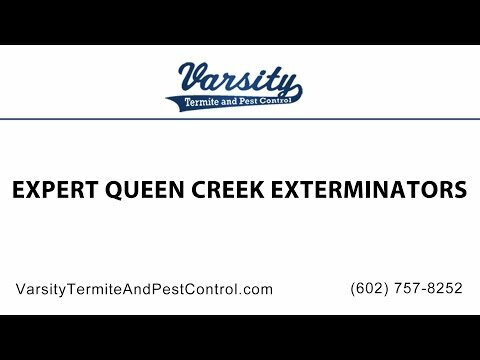 Varsity Termite and Pest Control can help you get your mouse problem under control if you live in Arizona. We will pinpoint the source of the problem, including openings into your home, nests inside your home, and sources of food. An experienced mouse exterminator will develop a plan to get rid of your mouse problem and give you advice on how to prevent future infestations. Call us in Arizona today to get an inspection from an experienced mice exterminator. You’ll soon find out why we are the pest control company in Queen Creek that Arizona trusts.